Self-sealing bags with a simple classic design. For documents, artwork, retail products and more, ziplock bags are the perfect professional packing solution at a budget price! 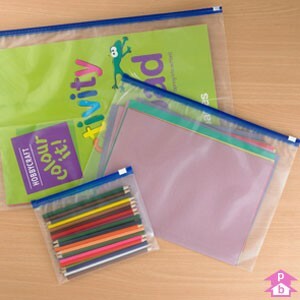 Ideal for storing publicity material or presenting retail products, high clarity ziplite resealable bags are a great cost-effective alternative to traditional ziplock bags. The premium polyfolio bag. 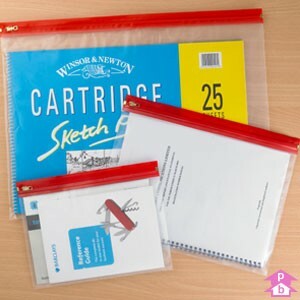 Featuring a snazzy red top and a highly durable metal zip fastener, these zipper bags are perfect for when you really want to show off your material. For those times when you don't need a ziplock on your self-seal bag, there's a fantastic range of grip seal bags at your disposal. Keep your contents dry, clean and secure - all at a bargain price! 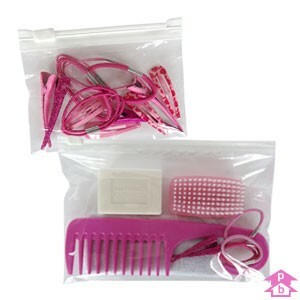 Grip seal bags' simple plastic fastener that makes them the ideal solution for storing items safely away from moisture, dirt and other contaminants time after time. Polybags' range of these self-seal bags are perfect for a range of small- to medium-sized items including nuts and bolts, electrical components and documents. Polybags' extensive range of plain polythene bags can be employed for a number of practical uses, including protecting furniture or art in storage or during removals, packing goods or lining boxes. Also popular in the retail trade, they can be used as display bags and to sell crafts, as well as in pet shops and even down at the local fair for the prize goldfish! A range of bags made from crystal-clear polypropylene film - a high-clarity alternative to cellophane, but also stronger and cheaper - that provide the perfect display bag for retailers everywhere. Give your products that extra sparkle and really show them off. Your customers won't fail to be dazzled! Whatever your waste disposal needs - household, office, building site or garden - Polybags' excellent range of refuse bags and sacks will take care of the job. Made from strong and durable recycled film, these bags will cater for general waste, different types of recycling and even specialist waste disposal, including asbestos or clinical waste. The must-have product for retailers everywhere, Polybags' extensive range of carrier bags will include the perfect carrier for you, whatever it is you sell. Available in clear or coloured plastic, made from standard polythene or biodegradable material and with a range of handle styles to choose. You can even design your own carriers and get them personalised for your business. The simple, professional solution for regular mail and courier deliveries alike, mailing bags are strong, lightweight, waterproof and easy to use. Polybags' extensive range includes extra-strong, tamper-proof, bubble-lined or coloured mailing bags to suit your business needs, or you can even personalise them with your own design to reinforce your brand on all of your deliveries. 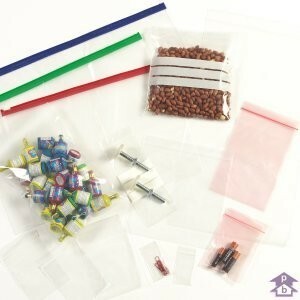 Get air-cushioned protection for objects of any type, size or shape with Polybags' fantastic range of bubble packaging. Protect delicate and valuable items during removals, in the post or even in storage with a selection of bubble wrap and bubble bags to suit all shapes and sizes. Protect your customers' clothes and linen during storage and transportation with Polybags' extensive range of garment covers. This collection of dry cleaning covers, laundry bags, duvet and linen covers are available in clear or pre-printed form, or even personalised with your very own company logo. Look out for the environment while getting the job done with Polybags' extensive range of eco-packaging. Developed in line with the latest research, this Biodegradable or Polybio packaging range includes carriers, kitchen waste and refuse bags, bin liners and more. Whether you sell sandwiches in a cafe or fruit and veg in a market, this range of produce bags will cover your food packaging needs. With a selection of products including ultra-high density film and paper packaging, this range is trusted by food retailers everywhere, from grocers to bakers and delicatessens to take away restaurants. If you want to package your products in an simple, professional yet affordable manner, but are faced with a variety of shapes and sizes, then polythene sheeting and tubing provides the perfect solution. Just cover the items in as much polythene as you need - and no more! - before securing with tape, banding or a heat sealer. Available in heavy duty, medium and light polythene. Extend the shelf-life of your food by up to five times with Polybags' fantastic range of vacuum packaging. Ideal for storing fish, meat, cooked or dried foods, and compatible with all major chamber vacuum sealers, professionals throughout the catering industry just love these vacuum bags!